^ 新聞急先鋒 (第1季). HBO亞洲. [2015-08-28]. ^ 新聞室風雲 (第1季). HBO亞洲. [2015-08-28]. ^ Hibberd, James. Aaron Sorkin's HBO cable news drama ordered to series. Entertainment Weekly. 2011-09-08 [2011-12-22]. ^ Ausellio, Michael. Exclusive: Jane Fonda Joins Aaron Sorkin's HBO Series (And You Won't Believe Who She's Playing). TVLine. 2011-12-14 [2011-12-22]. ^ 6.0 6.1 Weprin, Alex. Introducing 'Atlantis Cable News,' The Cable News Channel On Aaron Sorkin's 'The Newsroom'. TV Newser. 2012-02-08 [2012-02-08]. ^ Weprin, Alex. Aaron Sorkin's HBO Cable News Series To Be Called 'Newsroom'. TV Newser（英語：TV Newser）. 2011-12-05 [2011-12-22]. ^ Andreeva, Nellie. Aaron Sorkin's HBO Pilot Adds Trio. Deadline.com. 2011-06-16 [2011-12-22]. ^ Wightman, Catriona. Aaron Sorkin HBO pilot casts three more stars. Digital Spy. 2011-06-17 [2011-12-22]. ^ 10.0 10.1 Goldberg, Lesley. Olivia Munn Joins Aaron Sorkin's HBO Pilot. The Hollywood Reporter. 2011-05-18 [2011-12-22]. ^ Andreeva, Nellie. Aaron Sorkin's HBO Series Gets New Title?. Deadline.com. 2011-12-05 [2011-12-22]. ^ Rice, Lynette. 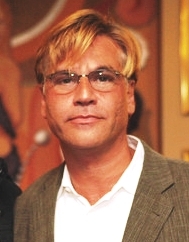 Aaron Sorkin: Come back to TV!. 娛樂週刊. 2009-04-10 [2011-12-22]. ^ O'Neal, Sean. HBO picks up Aaron Sorkin's cable news drama. The A.V. Club. 2011-09-08 [2011-12-22]. ^ Andreeva, Nellie. Aaron Sorkin's Cable News Network Project Awaits Greenlight At HBO. Deadline.com. 2011-01-23 [2011-12-23]. ^ The Social Network's Aaron Sorkin reveals future projects. BBC. 2011-01-21 [2011-12-22]. ^ Goldberg, Lesley. 'The Newsroom's' Aaron Sorkin on Idealism, Keith Olbermann and His Private Screening for the Media Elite. 好萊塢報導. 2012-06-21 [2012-06-26]. ^ 17.0 17.1 Kaplan, James. The Sorkin Way. 名利場. May 2012 [2012-06-26]. ^ De Moraes, Lisa. TV Column: 'The Newsroom's' ratings, and Dan Rather's review. 華盛頓郵報. 2012-06-26 [2012-06-26]. ^ MacKenzie, Carina Adly. Watch 'The Newsroom' Episode 1 for free: Will you stick around for Aaron Sorkin?. Zap2it. June 25, 2012 [June 26, 2012]. （原始內容存檔於2012年6月27日）. ^ Salem, Robert. The Newsroom: How much is too much Aaron Sorkin?. 多倫多星報. 2012-06-24 [2012-06-26]. （原始內容存檔於2013-02-15）. ^ Fletcher, Alex. Aaron Sorkin's 'Newsroom' gets UK Sky Atlantic air date. Digital Spy. 2012-06-18 [2012-06-26]. ^ Sky Atlantic HD präsentiert: "The Newsroom" unmittelbar nach US-Start empfangbar über Sky Go und Sky Anytime. Pressemitteilung Sky. June 15, 2012 [June 26, 2012] （德語）. ^ Az amerikai premier másnapján érkezik Aaron Sorkin új sorozata, a Híradósok. HBO Magyarország. [June 28, 2012]. （原始內容存檔於2012-07-01） （匈牙利語）. ^ HBO presenteert The Newsroom in Nederland. Totaal TV. 2012-06-25 [2012-07-03]. （原始內容存檔於2012-07-03） （荷蘭語）. ^ Torovic, Hadar. "The Newsroom": ארון סורקין מנסה לתקן את עולם העיתונות. !וואלה. 2012-06-25 [2012-07-01]. （原始內容存檔於2012-07-01） （希伯來語）. ^ Knox, David. SoHo set to replace W. TV Tonight. 2012-07-02 [2012-07-10]. ^ 原創大製作: 新聞急先鋒 - Welcome to HBO Asia. HBO asia. （原始內容存檔於2017-07-04）. ^ 新聞急先鋒S2:01, 週四, 8月8日 at 11.45PM（The Newsroom S201: First Thing We Do, Let's Kill All The Lawyers Thursday, 8 Aug at 11.45PM）. Welcome to HBO Asia. （原始內容存檔於2017-07-04）. ^ 新聞急先鋒S2:04, 週一, 8月26日 at 9.00PM（The Newsroom S204: Unintended Consequences Monday, 26 Aug at 9.00PM）. Welcome to HBO Asia. （原始內容存檔於2013-08-05）.